Love a bit of exposed brick in the kitchen - yum! i like the table, made of glass? so lovely, it must be pleasant to enjoy Chinese dishes on such a table, like it. I'm a total sucker for the exposed brick. I think its beautiful. Love it. that table is just perfect! it blends away to show the curvy chairs! I love exposed brick...i have mine painted white...but I truly love it natural or painted...and almost any color and with lucite...I have two Ghost chairs...love the juxtapostion between the two. The lighting in this and the pop of turquoise is perfect! Love the combo. That table is gorgeous. i love those bricks... and the white interiors..lovely. One of the things I will need whenever it is that I get my dream house is exposed brick. Amazing picture! That exposed brick gets me everytime - love it! 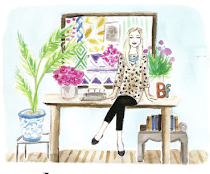 I love your blog, really excellent! That lighting is awesome against the brick wall. I'd love a raw, brick wall in my house. Love this space!! Congrats on making blogs of note! I love brick walls. But it has to be a REAL brick wall and this is the real thing. It looks so old- the historian in me loves it. so lush and raw, I love it!!! adore this design! i hope it will be mine! The elements of brick and glass, stunning! Hey, really nice article. Loved your insights and research. Cool brick look. I am truly adoring the mix of rustic looking old brick and cabinet with modern new fixtures and furniture. Very playful and quite pretty. 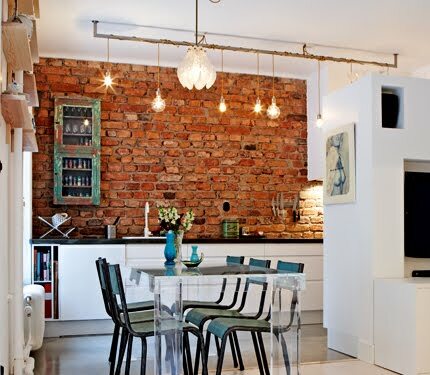 I like the exposed brick wall look and the light fixtures are fantastic! Lucite table looks amazing! Great pic! Affordable Basement Finishing has undertaken many assignments in Broomfield and Colorado for basement finishing and basement remodeling. They provide basement finishing and basement remodeling services at very affordable prices in Colorado and Broomfield. Their motto is to customer satisfaction through quality and delivery in time frame http://www.affordablebasementfinishing.com/. I love the brick in the kitchen...it gives a warm atmosphere at the environment. Eleguant and harmonious... Fabulous! These chair are looks fantastic . The wall looks so old but so beautiful.